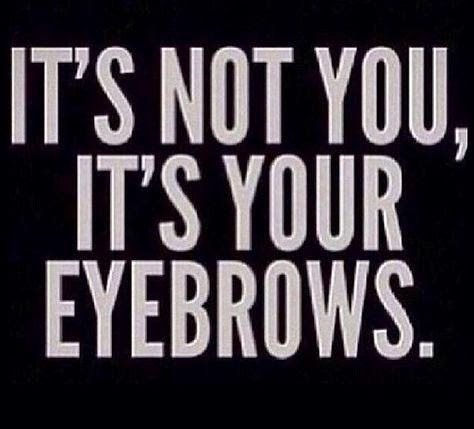 And funnily enough it always seems to be the girls with the worst looking brows posting them! 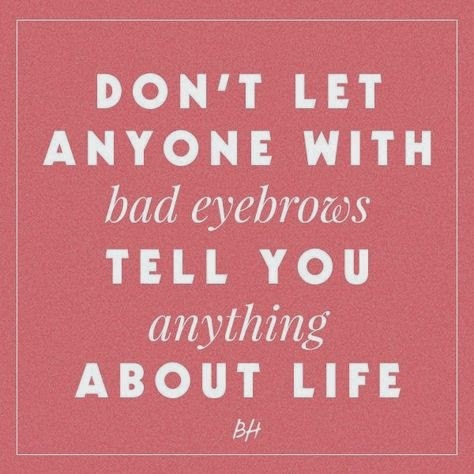 (lol) Even though I absolutely cringe into oblivion every time I see one (I mean WHY do somebody's brows mean they can't boss you around?! 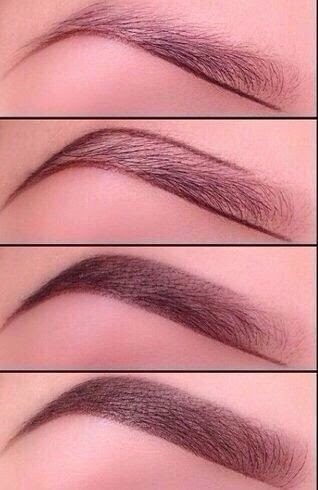 It is just so RIDICULOUS), I still do appreciate a good, strong eyebrow. It genuinely sends a shiver down my spine remembering the days where an eyebrow pencil was foreign to me. The only make-up I thought I needed was Maybelline Dream Matte Mousse (about four shades too dark for my skin, of course), Collection 2000 Mascara and black kohl eyeliner (or something else I could afford with my weekly pocket money) and some form of glittery hair gel to grease my hair back into a high ponytail. Please take into consideration that this was about 8 years ago (I won't scare you with a photo), and my cosmetic essentials have been notably upgraded since then. It was when I started university in 2011 that I started giving my brows a bit more attention. I started using a Rimmel eyebrows pencil, and soon upgraded to Benefit Brow-Zings (RRP £24.50). I swore by that little kit for years, I love the fact it has everything you need in a cute little compact set- Including the cutest mini tweezers! However that started to also be the downside, everything was TINY. The brushes are about three inches long (if that) so I found myself hunching over in a desperate attempt to get them both even. I had to mix the wax with a bit of the powder to get a darker look too, as I found the wax was too sheer on it's own and didn't outline my brows in the defined way I wanted. The only annoying thing about Dipbrow is that Anastasia Beverly Hills is an American brand, and isn't available in the UK yet. This means you have to guess which colour you are, which is pretty tricky! I originally ordered 'medium brown', but it was way too dark and I looked like the evil baby from the Simpsons with the monobrow. I re-ordered 'soft brown' and it is just perfect. 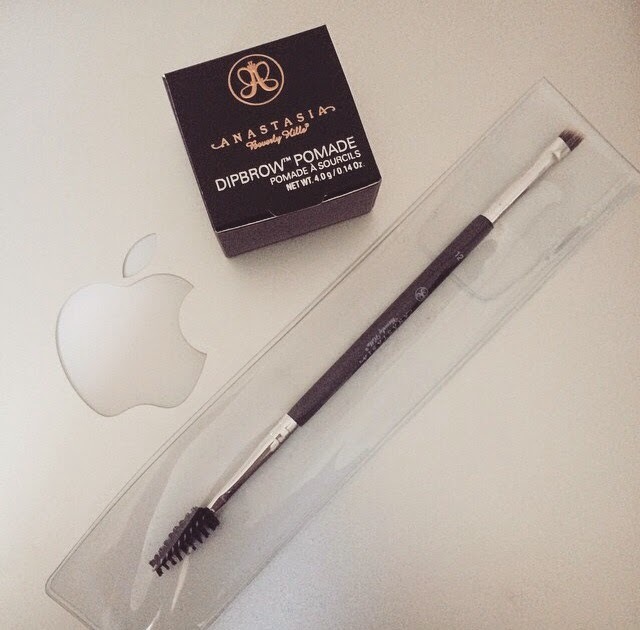 Start by lining the brow with the sculptured end of your brush. 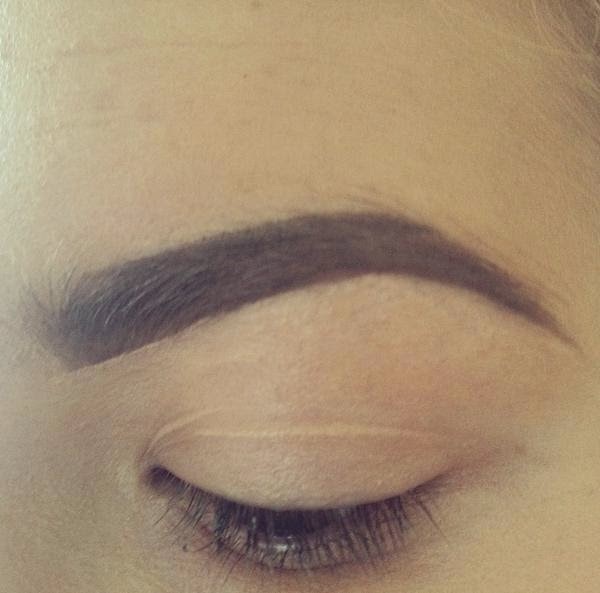 Begin with the underneath and then shape the top, leaving the top cm of each brow (as shown). It may sound and look a little tricky but as with everything, practice makes perfect! Has anybody else bought any Anastasia Beverley Hills products? I am such a fan of Dipbrow I want them all! Ive lusted after her matte lipglosses too! Kim K supposedly uses some in shade Hollywood but the cheapest I can find is £30, i hope she stocks in the UK properly soon!